One of the main issues for the beginners in the field of termination is the quality of the Internet and the possibility of low-cost connectivity to the network provider. 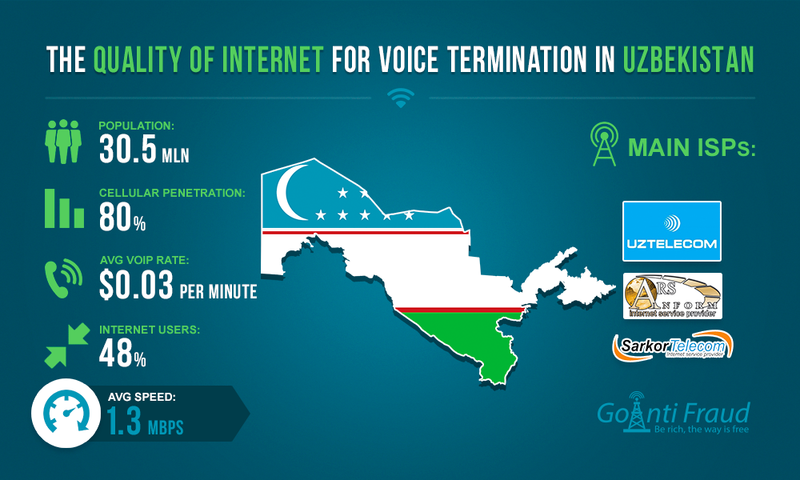 Today some terminators actively monitor VoIP forums of Uzbekistan; others fear a low speed of the internet, communication failure, and high tariffs. By 2016 Internet prices had remained high. The reason for this was the lack of its own cable, with traffic coming from neighboring Kazakhstan, as well as a ban on satellite communications imposed by the authorities and obsolete land lines. But, despite all this, the number of World Wide Web users grew rapidly. As of January 2017 the population of Uzbekistan is 30.5 million people. Of these, more than 12 million people use the Internet. The country is ranked 37th in the world in terms of the number of Internet users. Perhaps these figures were the result of the reduction of tariffs for Internet services. Previously, the cost of 1 MB was between $20 and above, but now it is $9. When using advantageous packages offered by service providers, you will spend a minimum of costs on the Internet. VoIP price per minute in Uzbekistan is $0.03. With proper choice of tariff for local call a terminator can make good money here. Local ISPs can hardly boast high-speed internet. The average data rate of the country is 1.3 megabytes per second. For this reason, terminators advise installing GOIP 16 gateways in the capital or major cities to get a good profit, ordering the speed not lower than 2,048 Kb/s. Fortunately, there are a lot of providers in Uzbekistan to choose from as there are more than 30 companies! There are 17 providers of DIAL-UP and ADSL-access. The largest of them are Uztelecom, Ars-Inform, and Sarkor Telecom. Most of the online market, up to 70%, recently belonged to the chief monopolist - Uztelecom, but over time, increasing demand for Internet services has been so great that the company could not fully satisfy the customers' requests. Today, Uztelecom boasts only 57% of the users of the market, with the remainder divided among other providers. Termination of VoIP traffic in Uzbekistan will bring profit to the beginner, with the right approach the business organization. The most favorable package of Internet services for the termination will be Optimal and TAS-IX from ARS-INFORM, as well as the tariff plans with unlimited bandwidth TAS-IX and "Convenient" (M-Series) from GALS TELECOM. A good option would be to order the Albatross package from ALBATROS. The cost of connection to the most expensive package Optimal ranges from $3.74 per month. But the customer has to make a $0.19 additional payment for the used traffic. The package does not include a high speed, so terminators prefer a more robust solution that provides up to 8 Mbit/s - TAS-IX from GALS TELECOM, to be paid for $6.24 per month.